In the Camera or Drawing view, you can draw on any drawing layer type with the Brush tool. NOTE: To learn more about the Brush tool options, see Brush Tool Properties (Bitmap) and Brush Tool Properties (Vector). In the Timeline or Xsheet view, select the cell on which you want to draw. In the Colour view, click a colour swatch to select a colour. In the Drawing or Camera view, start drawing. 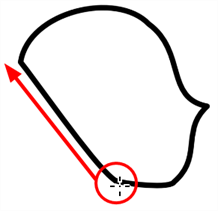 Hold Ctrl (Windows/Linux) or ⌘ (Mac OS X) to force a line to join the start and end of the shape while drawing.